Tomorrow is the 97th running of the Indianapolis 500. Throughout the month of May, all kinds of activities have been going on at the Indianapolis Motor Speedway. 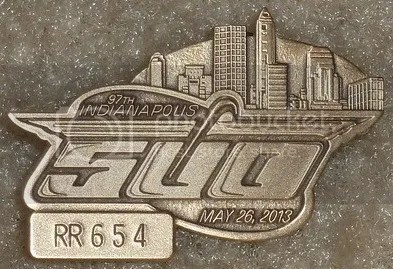 For those die hard race fans that got to attend, this pin was probably your best friend. For a cost of around $100.00 this pin would get you access to all of the events (except the actual race), plus garage access. Over the decades these pins have become quite collectible. Some of the old ones can sell for well in the hundreds of dollars. Dubbed The Greatest Spectacle In Racing, the Indianapolis 500 has come a long way since Ray Harroun won the first race back in 1911. Its funny to look at the lineup that day because everyone that raced was a rookie. Harroun won $14,250 for coming in first that day. Last year, Dario Franchitti snagged first place and won $2,474,280.